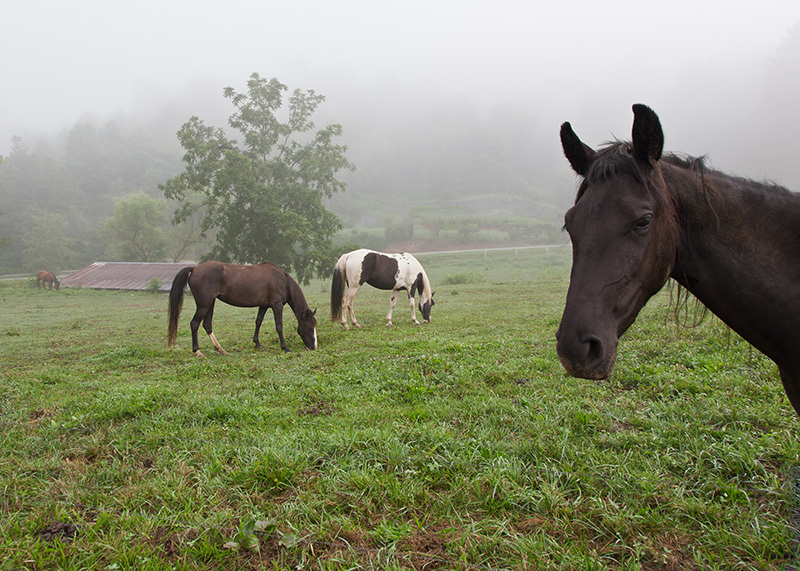 You’ve got to have some luck to get a good photo of grazing horses. 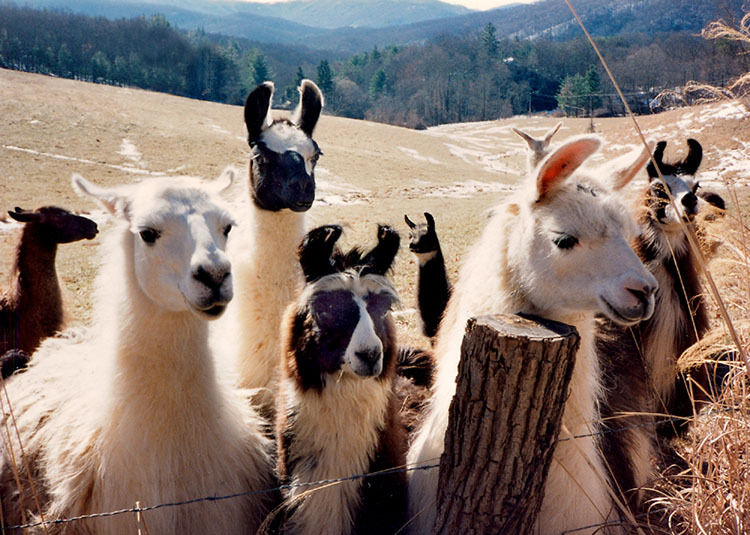 Or llamas. 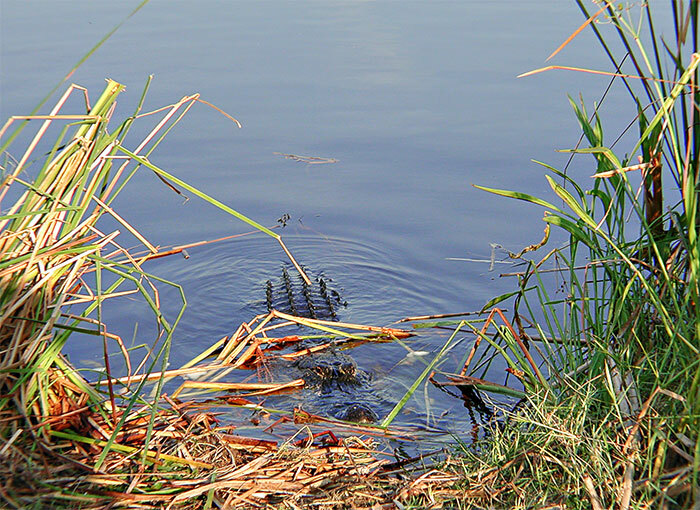 Or wildlife that tolerates human presence (what I call approachable wildlife*). According to my precise, randomized, longitudinal research data, horses will be found munching on grass/weeds 95% of the time, and llamas aren’t far behind. And if you want to get good pictures of them, you’ve got to 1) have a camera with you and 2) be prepared for those rare occasions when they may do something unexpected, like coming out of the woods, barreling straight at you. 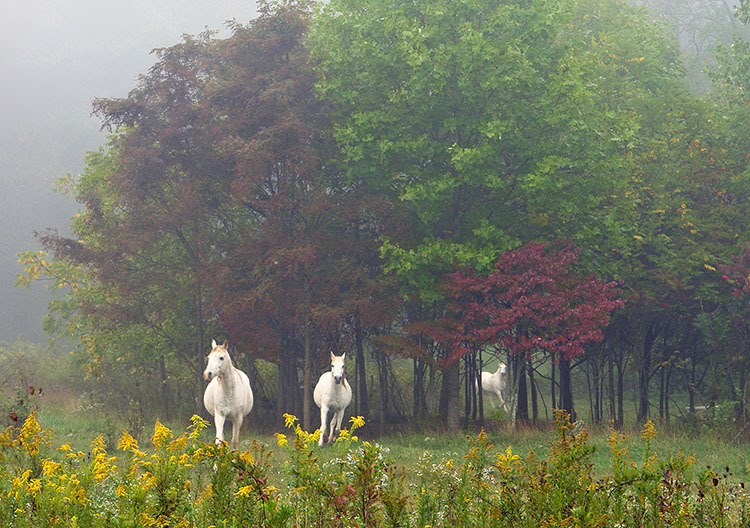 The story behind these white horses is that the nearest guy was out in the field munching, and I couldn’t see, or didn’t notice, the other two back in the woods. 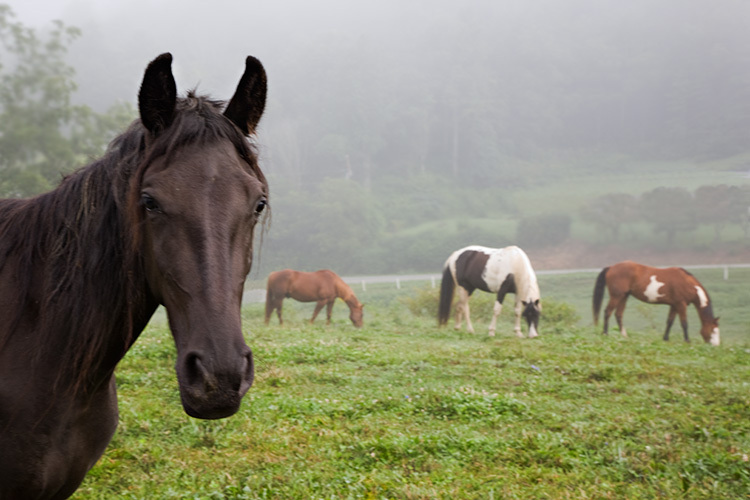 I stood right up against the fence, set my white balance to “Morning Mist,” and whistled, hoping he would raise his head, or do something. And the surprising result was that all three of them responded to my whistle. Now here’s the interesting thing: I drive by this pasture fairly often and have stopped more than once to try to get another photo of them. But they never again responded to my whistles, shouts, or hand-claps — just went on munching. So much for my career as a horse whistler. These next three horse photos were more deliberate. A friend of mine told me about them and how to get onto the gravel road behind the pasture. 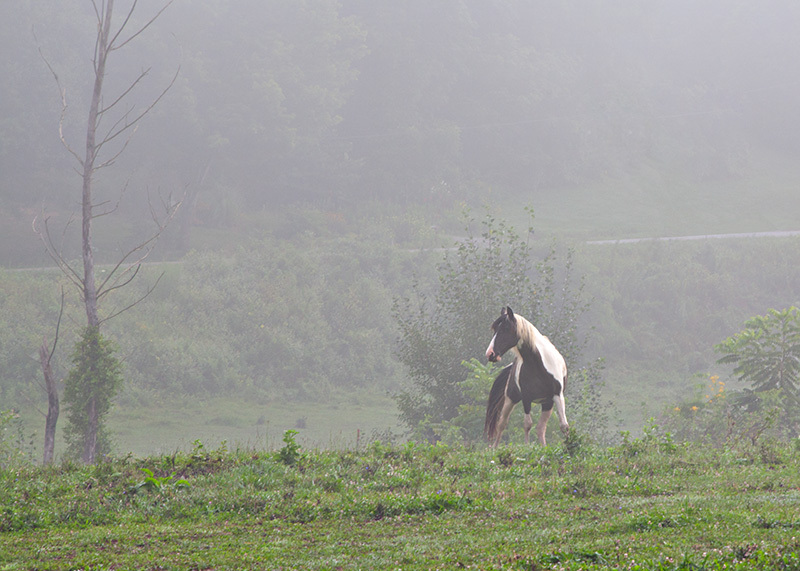 I went there on a misty August morning ready to be disappointed but also hoping to capture something more interesting than the usual grazing behavior. Well, lo and behold, it turned out that one of those guys honored me with his presence — walked right up and stared into my soul. And the others were positioned about as well as I could ask, making for an image I’m pleased to share. Then my new friend turned around and posed for a profile shot. Finally, the paint got into the act with this pose. If you follow my blog for a while, you’ll discover I’m partial to fog and mist, which are, by definition, not infrequent visitors here in the Smoky Mountains. Pretty much the same “advice” as for horses: carry a camera and be lucky. 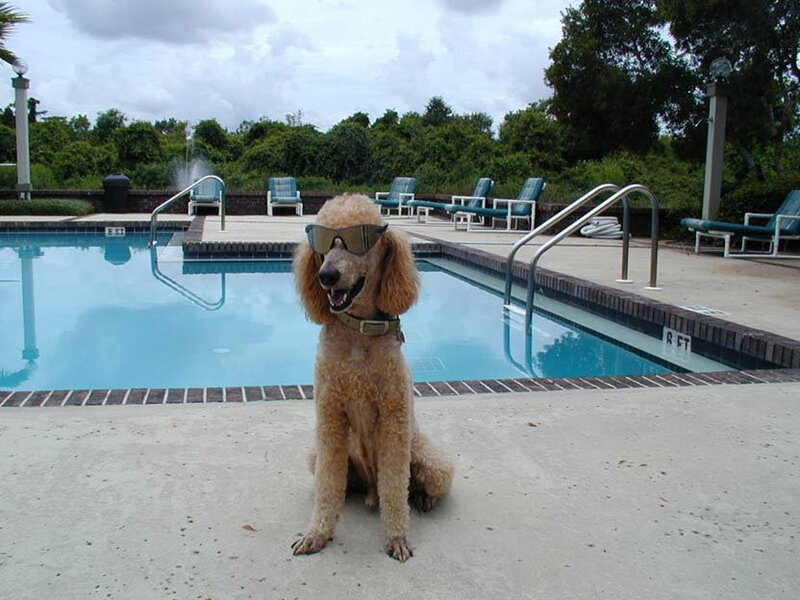 It also helps to have a standard poodle with you. . . . Okay, let me explain: These llamas were way out in the field when I walked up to the fence, and they couldn’t have cared less about me, just didn’t seem to notice . . . until my standard poodle, Mr. Red, came ambling along out of the woods behind me. Then the llamas spotted him, went to high alert, and suddenly became a thundering herd running toward me to get a better look at this four-legged alien creature. (I’m willing to bet they’d never seen a standard poodle before.) Luckily, I was carrying a little Fuji point-and-shoot film camera and got this snapshot, which was later scanned from a small drugstore print and cleaned up and enhanced in Photoshop. Film camera? Yep, the year was 1994, six years before I gave any thought to taking up photography. Mr. Red (above) was my friend and companion through some difficult years. Occasionally overprotective of me, he was a fun-loving good sport who enjoyed life until near the end, when he became sick and frail. Here he is about a year before I lost him. Majestic Mr. Red von Shangri-La was a champion show dog in his youth, before he came to live with me, when he was four or five. I must say he loosened up a good bit once we bonded. Wonderful, playful dog who loved being around women and children (men not so much, except me). I still feel the loss when I think of him. My third piece of advice is to hang around and take a lot of pictures. 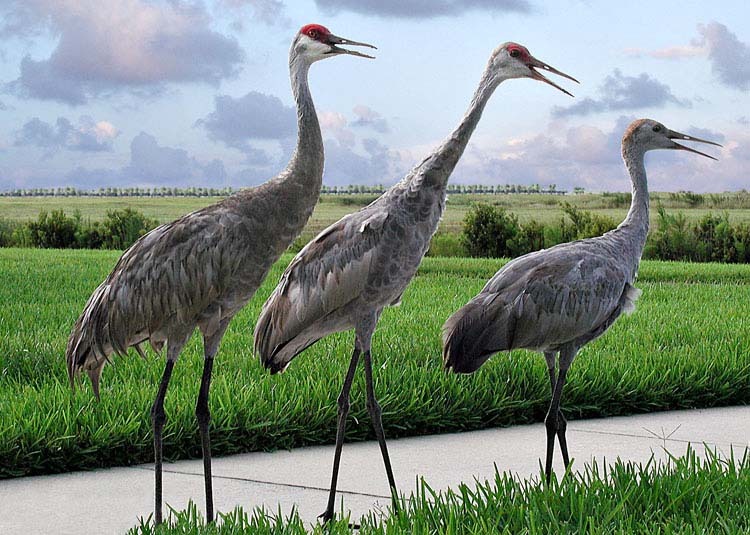 This family of Sandhill Cranes lived in a large field behind the school board offices where I worked, just outside of Melbourne, Florida, circa 2000. I had seen them before, from a distance. But on that late afternoon as I left work, there they were, right behind the building, maybe 20 feet away, feeding on something in the Bermuda grass. So I went to my car, traded briefcase for camera, and started following them around at a “safe” distance, taking lots of pictures. I tried to judge their tolerance for closeness so as not to frighten them away. Can’t remember how many shots I took, probably more than 30. Birds, like horses, don’t care how they look and make no effort to pose for the camera (despite my exaggerated claims above). Well just about every photo was a throwaway, unless you like to look at big bird behinds. Except there was this one image that looked promising. It had some problems I was able to fix in Photoshop — ugly factory buildings in the background that I cloned out and a drab sky that was replaced with this more dramatic evening sky. Okay, so it’s not an honest documentary depiction of that scene. And to that I simply say, “So what?” I am a decorative and/or fine-art photographer. Like a realist painter, I make images for people to hang on their walls. I also make it very clear that my images are “photographic interpretations,” not photo-documents. If you expect photographs to be completely accurate representations of reality, then you’re in the wrong place here. 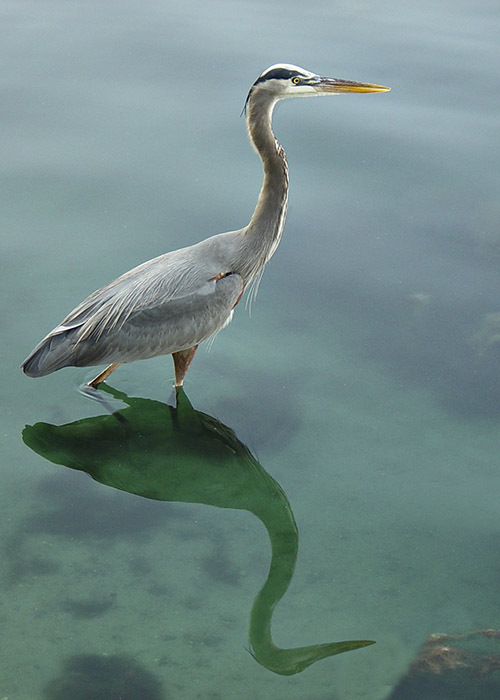 The great blue heron (below) was photographed at Lake Eola in downtown Orlando. Nothing special about the photograph itself: the bird was there and I took a properly exposed, properly focused photo of it. What is special is the Photoshopping. First, it was cropped from landscape (wider than tall) to portrait (taller than wide) orientation. Then came creating a reflection of the bird’s upper neck and head, which did not even exist in the original photo. The reflection in that area was obscured by more of that dark peat moss you see in the lower right-hand corner. The trick was to clone out the peat moss, replace it with water, select and copy the bird’s upper neck and head, flip it upside down, scale it and rotate it so it fit on the lower neck, and then use Photoshop tools to make it blend in with the reflection. My next blog will follow up on this one with a detailed, before-and-after, illustrated explanation of how I modified several images in Photoshop, including one or two from this post. I think it will be clear that for a good many images, post-processing in Photoshop contributes far more to the final success of the image than the process of capturing it with the camera. So if you want to see the image-editing steps I use, be sure to visit my forthcoming “Before and After” blog post. That’s close enough, I’m outta here! Not often you have an audience watching you take your photos, holding their collective breath. Or so their comments, after I backed away, would suggest. I guess a really experienced photographer — which I was not — would have taken a picture of them. 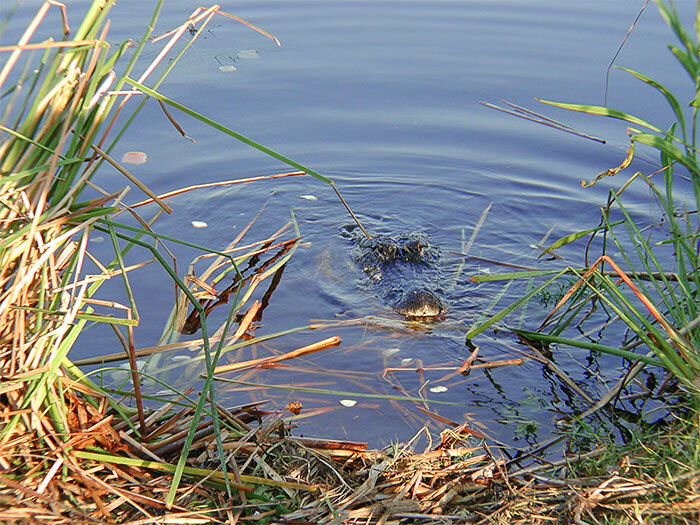 But I wasn’t taking my eye of the gator. ** Sandhill cranes are indeed a very large bird, reaching a height of up to 4 feet! You can read the Wikipedia entry here: http://en.wikipedia.org/wiki/Sandhill_Crane.